RBTH presents a selection of views from leading Russian media on the latest developments in Ukraine, featuring analysis of the new militia-led offensive underway in the south of the Donetsk Region, reported to involve Russian units, as well as growing suspicion that the mysterious funerals of Russian soldiers from a Pskov division may indicate its presence in Ukraine. 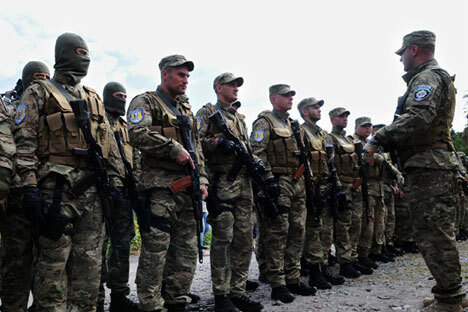 The armed units “of the breakaway Donetsk People’s Republic” have advanced to the Sea of Azov, seizing the city of Novoazovsk, not far from Mariupol. According to a Kommersant report, the Ukrainian Army retreated from the city with virtually no resistance. “The border is open, and we are admitting anyone who wishes – including refugees – in both directions,” a special Kommersant correspondent cited a solder from the unrecognized Donetsk People’s Republic as saying. The pro-autonomy militia fighters have tanks and other military hardware at their disposal, and the breakaway militia forces are continuing to approach Mariupol, the second-largest city in the Donetsk Region. “The offensive on the Ukrainian Army’s position in the south is indeed large-scale,” Kommersant reports. Rossiyskaya Gazeta writes that because of the aggravated situation in the southeast, where the rebels have launched a counteroffensive, the Ukrainian authorities intend to transfer all of the military hardware currently located in warehouses to the East. “Without additional permission and agreement, instructions are being issued to repair or modernize all third- and fourth-category military equipment,” the newspaper cites a Ukrainian government order as saying. Third- and fourth-category military equipment includes vehicles in need of repair and outdated equipment. Rossiyskaya Gazeta believes that this measure indicates that Ukraine is incurring major losses. Meanwhile, in the last several days media outlets have been discussing the funerals of servicemen from the north-western Russian city of Pskov who were killed under unexplained circumstances this summer. According to one account, the troopers from the 76th Division may have been killed in Ukraine. However, there is no official information on the matter. Mikhail Fedotov, head of the Russian Human Rights Council, told Gazeta.ru that the council will request that the General Prosecutor’s Office conduct an investigation into the situation in Pskov. Gazeta.ru also cites Pskov Regional Deputy Lev Shlosberg, who is conducting his own investigation: “Between 100 and 160 people from the Pskov division may have been lost during the conflict in Ukraine.” However, Shlosberg has no evidence to confirm this claim. Russian Presidential Press Officer Dmitry Peskov said on the evening of August 27 that information regarding the deaths of Russian troopers in Ukraine required further verification. Rumors are also afly among the Ukrainian authorities that the Russian military is directly involved in the military conflict in southeastern Ukraine. Moskovsky Komsomolets quoted Zoran Shkiryak, advisor to the Ukrainian Interior Minister, who associates the Mariupol offensive being carried out by militias from the Donetsk People’s Republic with Russian military aid: “There has been a full-scale military invasion by the Russian Armed Forces in Ukrainian territory.” Meanwhile, Prime Minister of the Donetsk People’s Republic Alexander Zakharchenko said that while there are indeed Russians among the separatist fighters, they are all volunteers (including regular servicemen who are currently on reserve or on leave).